Our servo gear units stand for dynamics and precision. They feature a sturdy, warp-resistant design and a compact build. We offer low-backlash planetary servo and helical-bevel servo gear units that cover a torque range of 25 to 3000 Nm and can be used even in complex motion control applications. How do servo gear units work? What types of servo gear unit are available? What is a servo gear unit? Like all gear units, servo gear units serve as converters of torque and speed and are therefore the central component of every servo gearmotor. 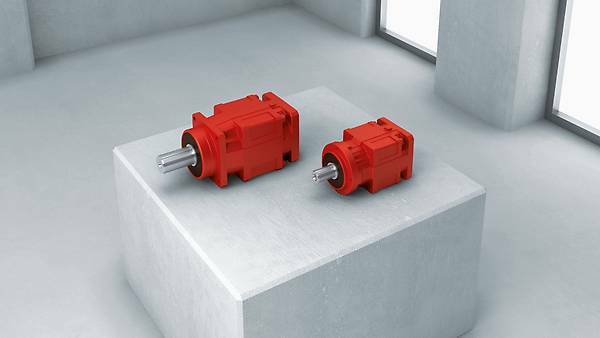 The special feature of a servo gear unit: Thanks to its high torsional stiffness while maintaining a very low to constant rotational clearance, it enables extremely high acceleration and high torques. Servo gear units are therefore indispensable for plant operators whose applications require high positioning accuracy, short cycle times, exact speeds, high processing speeds, and maximum dynamics. A servo gear unit reduces the speed of a motor. It transmits the flow of force in different ways depending on how its gearing and gear unit stages are arranged and operate. The gear ratio i is therefore one of the most important characteristic values of a servo gear unit: It specifies the ratio of the input speed (on the motor side) to the output speed (on the machine side). Low-backlash processing and optimized gearing ensure that the servo gear unit is capable of receiving higher overhung loads than standard gear units and transmitting high acceleration torques at high speeds. The primary servo gear units used in industrial drive technology are coaxial gear units/planetary gear units and right-angle gear units/helical-bevel gear units. Planetary servo gear units always transmit the flow of force coaxially. In their center, there is a sun gear that turns in the direction of rotation and at the speed of the motor. Three or more planet gears that transmit the received force to the outer annulus gear on the output side rotate around this sun gear. Due to this design, the input shaft and output shaft move in the same direction. That is: They have the same direction of rotation. In contrast, the gearing in a helical-bevel servo gear unit diverts the flow of force at a right angle. The input shaft and output shaft are therefore perpendicular to each other and they rotate in opposite directions. The outstanding features of servo gearmotors are definitely power, dynamics, and precision. Use our modular system and see the multitude of gear unit and motor constellations in our servo gear unit section for yourself: For example, you can combine our PS.F.. or PS.C.. planetary servo gear units with CMP.. synchronous servomotors, a DRL..-type synchronous servomotors or with DR.. AC motors. Or instead choose a design with our BS.F helical-bevel servo gear units. With SEW‑EURODRIVE, you can create the ideal gearmotor that provides the exact drive behavior that you need for your application and requirements. The low-backlash planetary servo gear units in our PS.F.. and PS.C.. series combine high precision with a high power density and have an extremely compact design. This feature allows you to save plenty of space while using them. The main feature of the low-maintenance helical-bevel servo gear units in the BS.F series is their durability and flexibility. Another benefit: Their rotational clearance remains constant over the entire gear unit service life.